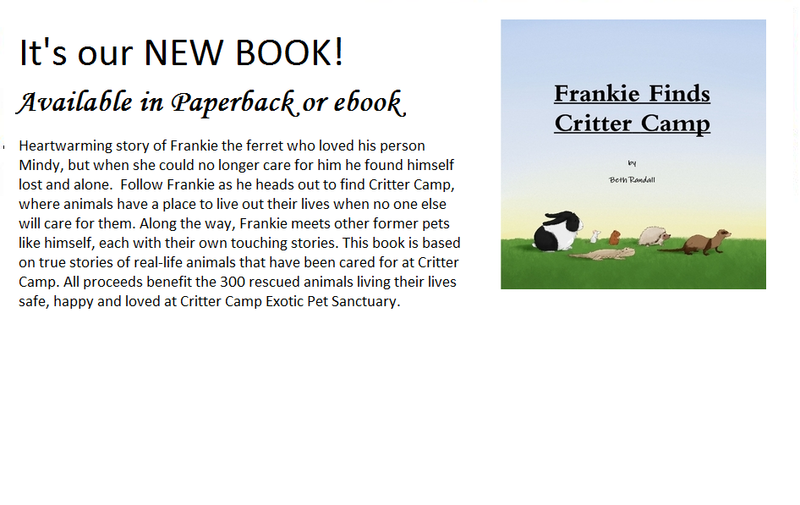 Our Book: Frankie Finds Critter Camp - Welcome to Critter Camp! Ebook click here! Only $1.99 ! Paperback click here! This story could be the next big hit animated feature film! Imagine a cross between Homeward Bound and the Secret Lives of Pets, with a bit of Watership Down added in! Follow a resourceful abandoned pet ferret on his journey to find safety. Along the way he meets up with a hedgehog in a dumpster, a hamster left in an empty house, a rabbit tied to a tree, a tiny pet mouse let go in a forest preserve a pet lizard forgotten in a park. Frankie the ferret remembered his first owner, who loved him very much, showing him a place called Critter Camp Exotic Pet Sanctuary on her computer and she told him she wanted to visit there because they took in all of the pets no one wants. She told him it wasn’t too far away and as she pointed out of her bedroom window and added that it was off where the sun goes to sleep at night. So Frankie leads his new found friends to the west, protecting them from adversity and giving them hope. Just as all seems lost, the nights are getting too cold and they cannot go on, a pair of cats find them in a cornfield. No the cats do not eat them, they tell them that they live at a place called Critter Camp and that their human will care for all of these little creatures. The kitties help the animals make it to the porch where Frankie sees the Critter Camp sign he saw on the computer long ago and he knew they would be safe. This film, based on the book Frankie Finds Critter Camp, will appeal to all ages, animal lovers of all types, and advocates for animal welfare in a family friendly engaging way. It is completely original and unique! The added bonus is that these animals’ stories are based on true life rescues that Critter Camp has taken in, AND a percentage of all proceeds will be donated to care for animals at Critter Camp! Imagine the marketing! Plush characters, toys and more toys, board and video games of their journey, clothes, costumes, & sequels and series – we have literally thousands of rescue stories! ​According to the 2012 US Pet ownership & demographics sourcebook by the AVMA there are approximately 10 million households with ferrets, 46 million with rabbits, 30 million with hamsters, and 20 million with lizards- these are all untapped audiences who WILL pay to see a movie with their pets in it!!! Direct inquiries to us on our Contact page- agents, animators, actors, studios welcome! The movie opens with a musical montage similar to UP. A little toddler girl, Mindy, is surrounded by stuffed animals, she digs thru them until she finds her well worn ferret toy which she hugs tightly. Blend to the girl about age 6 coloring in a coloring book of animals, only the ferret page. Next she is 11 and is on her computer – you see the colored ferret page taped to her wall behind the computer, and the tattered ferret plush beside her computer. She is searching many sites on ferret care, one of which you see is the Critter Camp Ferret Care page. Action starts with her Twelfth birthday- her mom and dad surprise her with one ferret and a cage and food and an exercise ball. She grabs up the ferret and says thank you thank you, where is the other one? She says you know I’ve told you they need to live in pairs! Her mom says no we are only getting one, her dad mumbles you’re lucky to get that one. Mindy asks, did you get him at a rescue? They said no they went to the pet store and bought the stuff the clerk said they needed. Mindy didn’t want to look disappointed that they hadn’t rescued a ferret even though she knew so many needed a home, so she said she would give him all the love she had. She gently told her parents that the cage was too small and that they don’t use an exercise ball. Dad crankily grabbed the ball to return in and said she’d have to make due with the cage. Mindy said she’d keep her ferret out of the cage most of the time anyway in her room. Now what to call him? He was small and looked like a hot dog! Her mom said yeah a little frankfurter! Mindy’s eyes lit up- that’s it- Frankie! We see the next year unfold as she gives up extra curricular activities to be with her beloved ferret, holding him in her lap, playing with him with cat toys and just generally loving him to pieces. She shows him Critter Camp on her computer and explains that she wants to visit there someday. She said it wasn’t too far away and then pointed out of her window to the setting sun and told Frankie that it’s off where the sun goes to sleep! All the animals are safe there and loved. She wanted to volunteer there one day. In the background we hear escalating fighting between her parents and she holds Frankie close for comfort. One day her mom comes into her room crying and tells her that she and her dad are getting divorced. Mindy cried but says you are both so angry all the time it will probably be for the best. But then her mom says we have to move and you cannot take your pet with you. Now Mindy is hysterical sobbing begging pleading. She cannot lose her best friend, Frankie! Days later her mom says that Mindy’s friend’s sister will take the ferret. Mindy isn’t convinced that this girl will love Frankie the way she does and protests, but to no avail. The sad day comes and Mindy prints out stacks of information on how to care for Ferrets and gives it to the girl along with her precious little buddy. Sadly Mindy’s fears were founded, as not too much later this girl decides she doesn’t want to clean up after Frankie anymore, and never lets him out of his small cage. Her mom puts an ad online- free ferret with cage. A scruffy man in a beat up truck shows up and tosses the cage with Frankie in in into the back of his pick up truck. Frankie is terrified! As the man rounds a corner too fast the cage tumbles out and breaks apart. There is Frankie, a domestic tame pet left to fend for himself in the wild. What should he do? Can he find Mindy again? Frankie runs and runs and finally hides underneath a large metal box behind a store. He is exhausted. He falls asleep and has a dream about Mindy and the place called Critter Camp. He wakes and says to himself that’s it! I’ll go to Critter Camp! It’s where the sun goes to sleep! But first he hears a noise in the metal box and being a curious animal he climbs up to check it out. He falls into the box and it is full of garbage! It smells and is sticky, he doesn’t like it. But he hears the noise- snort snort, huff huff. What is that he thinks? He starts moving things around and finds a cage with a weird spiky small animal inside making these noises! A tiny nose pokes out of the ball of spikes. Frankie says what are you? The animal replies I am a hedgehog. Frankie says I’ve never seen a hedgehog before! What is your name? I don’t have a name her replies timidly. Frankie says well then I will call your Bravehog, because you must certainly be a brave hedgehog to still be alive buried under here. Bravehog replies shyly well I guess that is ok if you really think so, I do like it. Frankie tells Bravehog his story and where he is going and asks if he’d like to come along. The hedgehog says oh my yes I surely would! But right now I am very hungry, Frankie says so am i! What do you eat Frankie asks. Bravehog says bugs, worms, cat food, cooked chicken and eggs, that kind of food. Frankie says I can eat that too! I need a lot of protein Mindy told me long ago, and no plants! So they rummage around in the dumpster and find a half eaten piece of chicken from a sandwich that they share, and drank some water from a cup that had melted ice in it. Twilight was setting in and Frankie said we must go now and follow the setting sun! He asked if it would be ok for Bravehog to travel at night. He answered why yes! I am what is called nocturnal and I am awake all night! I’ve heard that my wild cousins in Africa can run 10 miles a night! So Frankie was impressed and relieved that his travel partner could easily keep up with him despite his tiny little feet. So they scrambled out of the dumpster and set off to the west. As the sun comes up The two are getting tired and decide to find a place to rest. They see an abandoned house with a broken window near the ground. Frankie tells Bravehog that this goes to a basement- he knows because he was kept in one all alone for awhile before he fell out of that truck. They slip into the window taking care not to get cut on the remaining glass. Frankie helps Bravehog because he is not as agile as Frankie. They begin to look around and see a cage. Hoping there is some kind of food in it they go near it and all of a sudden hear a little squeak. There was a little hamster in the corner of the cage terrified. Frankie said don’t worry we wont eat you! He introduced himself and Bravehog and told the hamster their story. He asked what her name was and she said I am a Syrian hamster and my name is Peaches. She asked to go with them please and of course they agreed. They helped Peaches get out of her cage and she showed them where some old cat food was in the corner and they all ate it. As they ate Peaches told the boys that her owners just moved away one day and left her and the cat there in the basement. The cat broke out of the window and ran away but Peaches was left there to starve. There was a puddle of water on the floor where it had rained into the window and they all had a nice long drink. Peaches said cat food wasn’t very good for her but she hadn’t eaten is a long time so it would have to do for now. She said she preferred bugs and seeds and plants. Again the sun was setting and the trio set off towards their safe haven at this Critter Camp they hoped to find. As they traveled it was hard for Peaches to keep up so she rode on Frankie’s back part of the time. She hopped off Frankie and scrambled up to the road they were following alongside in the ditch and said wouldn’t it be easier to walk up here? Frankie raced up and grabbed her, bringing her back to the ditch and said NO! There are big machines- cars and trucks- that move very fast on that road and will squash us flat! Soon a large truck whooshed past and Peaches trembled. Thank you Frankie for saving me again! The sun comes up and they are near a small run down house in the middle of nowhere. They cautiously approach and find a rabbit laying on the ground tied to a tree with a rope. Good heavens what has happened to you Frankie asks. The rabbit slowly and sadly says my people tie me out here for days and my collar hurts my neck. They don’t like me and don’t take care of me. I’ve given up. Frankie says no please don’t give up! And he introduces his band of travelers and tells the rabbit their stories. He asks if the rabbit would like to come along and if he has a name. He says yes I would like to join you and I do not have a name. Everyone just calls me rabbit. So Frankie said if it’s ok we will call you Rabbit too because in a book Mindy read to me there was a Rabbit who was strong and took care of himself. Rabbit agreed. Peaches proceeded to chew the collar off of Rabbit so he would be free. Rabbit and Peaches ate some grass, Bravehog found some more worms, and Frankie caught and ate a fish he saw in a pond where they all took a drink. After resting awhile They set off again at sunset. Rabbit easily kept up with and passed up Frankie and Bravehog and Peaches decided to ride on him for awhile. It was great fun but hard to hang on! Soon it began to rain- lightly at first then harder. Everyone was getting cold they needed to find real shelter soon. They were in a forest now and stumbled across a small building. They all huddled under the stairs and dried off. Bravehog said I must tell yout hat I have to stay very warm or I’ll go to sleep a long time and may not wake up. Bravehog said don’t worry when I am calm my quills lay down and you won’t get hurt if you are close to me. So Frankie and Rabbit curled around him to keep him warm, and peaches laid on top. Frankie woke up nose to nose with a tiny white mouse as the sun shone beside the stairs. Frankie had never seen an all white mouse before! The little mouse said Hi I am snowdrop! My person let me go out here because she wanted me to “be free.” But I am a pet mouse and I don’t know how to live on my own! I am so happy to see you even though I have no idea what you are! Frankie smiled and explained to snowdrop all about their stories and their quest to find Critter Camp. He said snowdrop was more than welcome to come along, and she readily accepted the invitation. She showed the gang the kitchen at the forest preserve where she had chewed a hole in the wall to get into and found some food. She and peaches had to chew it more to make it big enough for everyone to get inside. They found packages of crackers and cookies that Peaches and Snowdrop ate, and some packets of tuna that Frankie and Bravehog tore open and devoured. Rabbit stayed outside contentedly nibbling on grass. Snowdrop took them to a puddle where they all drank until they were full. Off they went towards the sleepy sun going to bed, the determined travelers on their mission. It was beginning to get colder at night and that made Bravehog slow down. Sometimes he needed to ride on Rabbit and burrow into his fur to stay warm. Leaves were changing colors and falling. Frankie knew that meant the weather would get colder. That happened just before Mindy took him outside to play in the freezing white stuff she called snow. Frankie knew that none of them could live outside in that cold, he was beginning to get worried. But he would not show it. He kept a steady resolve and brave face for his friends. As the group got weary and the sun was rising they found them selves in a park. There was a hollow tree and they all climbed inside. There were bugs for Peaches, Snowdrop and Bravehog to eat, but nothing for Frankie. Finally Bravehog says try this worm it has a lot of protein! Frankie says yuck! But eats it anyway. Rabbit nibbled more grass. There’s a small fountain nearby and they go for a drink. When they come back to their hollow tree to rest they hear a thud! A lizard fell out of their tree right on top of Rabbit! They all scattered then came back to see what this thing was. It looked dead. It was dark, cold and its eyes were shut. It’s tail was black, the rest of the body a dull grayish brown. Slowly one eye opened and the lizard moved a bit. He said I’m sorry to startle you. My person left me here in the park a few days ago and it’s been so cold I was sure I would die here. Frankie said they understood because Bravehog needed to be warm too. They all introduced themselves and told their stories and Frankie explained where they were going. He asked if the lizard had a name. He said I am a bearded dragon and my kind comes from Autralia , we need to be very warm all the time. But he did not have a name and Frankie said well, let me think about it for awhile. He also asked if the lizard wanted to come with them to Critter Camp. He said if I live that long, yes I would. Frankie said we will carry you and you will make it, I promise! They all huddled together in the hollow tree and kept warm and rested until it was getting dark and time to head west again. They began to find a lot of farms- fields of corn and soybeans, some were harvested and bare some were brown and ready to harvest. There were lots of things for everyone to eat. As the sun came up they kept going, they had to. When all of a sudden the bearded dragon says find cover NOW! They ran quickly as a huge hawk started to swoop down at them trying to find his own dinner! Finally they got to a full cornfield and when they got there all were panting and out of breath. They told the lizard thank you over and over. Then Frankie said how did you know there was a giant bird coming at us? The Bearded dragon said he has a “third eye” a light sensor on top of his head to help warn him of predators. He showed it to the group and they were all very impressed! They were all also exhausted. So they fell asleep in the cornfield all huddled together around the lizard and Bravehog. Frankie thought he felt a snowflake. He softly cried hoping not to alarm the others. He knew that if they did not make it at least they had each other, but he felt responsible because it was his dream that got them that far and put them through all these perils. Not sure if he is dreaming or not Frankie hears a rustle, then it gets closer, yes it’s real something is in the cornfield with them. He vows to protect the others with every ounce of strength he has no matter what this is. Snowdrop wakes up and cries CATS! Two cats! They will surely eat us all! The gray cat said no they would not eat them. They are not supposed to eat other pets and they’ve seen pets like them before. Frankie was puzzled. How could any cats have seen such an odd group of animals before? The black cat with a crooked arm said He’s Fred and I am Crookshanks. We live at a place called Critter Camp and there are all kinds of pets there just like you guys. Frankie could not believe his ears! Critter Camp? Really? Is this a dream? Could it be real? Fred said to Crooks we better bring them to CritterCampMom, she will know how to care for them. Crooks said yeah I suppose we should, and maybe we’ll get an extra treat for saving them too! The cats helped the small cold weak band of travelers towards a big white house near the field. They helped each of them up the stairs to the door. Frankie saw the sign on the porch that said Critter Camp Exotic Pet Sanctuary. He still couldn’t believe it! But it was very late at night, surely everyone was asleep, they still may not survive out in this cold all night. The cats began to meow at the door, and a woman with long blond hair opened it and gasped. Where did you all come from?! Oh my who cares, lets get all of you taken care of right now! Fade out then back in to see the bearded dragon now named Phoenix because of his dramatic rise from near death. His tail was infected and had to be amputated. He is lying under a basking lamp in a large tank with a hideout and a basking rock a bowl of water and a bowl for food- worms and greens. Rabbit lived in a huge free range area with a dozen other rescued rabbits (after he was neutered!) and he got to tell them his story over and over. Bravehog got his own big cage with a giant wheel and soft sleep sack and blankies. He got to eat yummy superworms and the special protein mix critter camp makes for all its insectivore mammals. Frankie was the hero of the free range ferret room. Telling the amazing adventure he had led over and over while the other ferrets hung on his ever word! Fred and Crooks had tuna for a treat for several days because they did such a good deed! One day years later a girl of about 19 came to Critter Camp to volunteer for a day. She wanted to clean the ferret room because it reminded her of her beloved ferret that her parents made her give up. She said she tried to track him down but no one knew what happened to him. She thought about him every day and was so sad, hoping he was ok but fearing the worst. She said he would be old by now, I just hope he is safe and loved. She told Critter Camp Mom about the good times she had with her ferret named Frankie. Frankie slowly looked up- it was Mindy! She had found Critter Camp too! He climbed out of his sleep sack and crept over to her, his age slowing him down. Mindy began to cry. This is my Frankie! Where did you find him? Critter Camp mom told her the story of finding the group of animals on her porch late one night years ago. Mindy spent the rest of the day holding and playing with her sweet ferret, crying and telling him how much she loved him and how proud of him she was that he found Critter Camp and even helped save other pets too! She promised to come visit him and she did, often, until the end of his days. All the rescues are based on real life animals that Critter Camp has taken in, stray ferrets, a hedgehog found in a dumpster, a hamster abandoned in a rental property, a rabbit tied to a tree until its collar dug into its skin, a white mouse found at a forest preserve, a bearded dragon found in a park whose tail had to be amputated. Critter Camp Exotic Pet Sanctuary is the only rescue of its kind, taking in only small unadoptable and unusual pets to stay for sanctuary, is all volunteer operated, fully licensed and insured. A percentage of all profits from this film and the book go to support the rescue and to build a new stand alone facility so Critter Camp can help more animals. During the Credits show families, couples and individuals going to small animal rescues to adopt their new pets, then they can go to pet stores to buy supplies too. There are thousands of small pets waiting for forever homes in shelters across the country. Please adopt then shop.